Does anyone remember Na Fianna Éireann? It is 200 years since the birth of Charles Darwin and 150 since the publication of his profound theory of evolution. One hundred and twenty-five years ago seven men, four active members of the IRB, emerged from Hayes’s Hotel in Thurles having founded a Gaelic Athletic Association. Just 40 years ago man landed and planted a flag on the moon. The Dublin Area Rapid Transit (DART) system began to provide a necessary public service 25 years ago. These events have been marked by lengthy radio interviews, weighty journal articles and vast amounts of newsprint in Ireland. There is something of a sophisticated form of triangulation in the measuring of the significance that is accorded to any anniversary and, as a result, the attention that it receives from popular and academic media. The first point of the triangle is the date. Obviously anniversaries every ten years offer the first opportunity for remembrance, so the tenth or twentieth anniversaries are usually well remembered, as will be subsequent decades for the first century or so. These dates are only eclipsed in importance by quarter-of-a-century dates such as 25th and 50th anniversaries, etc. But the pinnacle is no doubt centenary anniversaries, and the first, the 100-year anniversary, is generally the most significant. The second point on this triangle is the location of the event. So while the launch of the DART may have had a significant effect on the social life of Dublin’s coastal belt and will be remembered for such, it will probably have received little attention outside of Ireland’s national media. In much the same way, the anniversary of the foundation of Euzkadi ta Askatasuna (ETA) 50 years ago in the Basque Country has elicited little attention beyond France or Spain. The last point on the triangle is the political significance of the anniversary. The élites of societies usually decide whether an organisation, event or person is entitled to be commemorated. While the 40th anniversary of the moon landing has been a major event for the USA and much of the western world that it dominates culturally, militarily or economically, the élite in China have understandably ensured that the event has received significantly less attention in both scholarly and popular press. 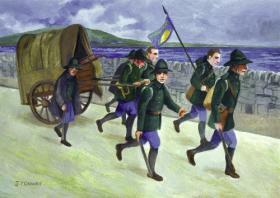 The 100-year anniversary of the foundation of Na Fianna Éireann was celebrated on 16 August this year. The anniversary has passed by with little attention from the media or either government operating on the island of Ireland. Yet the organisation participated in the main events of this country’s most important historical epoch, from 1909 through to 1923, and in locations all over the 32 counties. The question of why so little attention has been devoted to the commemoration can be answered by looking at Na Fianna Éireann’s activities and objectives. The only possible conclusion is that the élites in Irish society are embarrassed by the legacy of an organisation that aimed and strove for a comprehensive national and social revolution. So who were this bunch of lads who still embarrass establishment politicians and scribes? In early August 1909 Constance Markievicz was attending a going-away party for Frank Maloney, a member of the executive of Sinn Féin who was emigrating to New York with his wife. Markievicz had since early in the year been fascinated with the sudden growth of the Baden-Powell Boy Scouts, so much so that she had attempted to form a squad of nationalist scouts and spoke on the subject whenever she was given a platform at radical nationalist public meetings. Another attending the party was Bulmer Hobson, a man who had for a number of years organised a sporting and cultural organisation for young nationalists in Belfast. 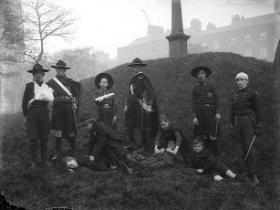 The group had been called Na Fianna Éireann and after its foundation in 1902 it had seen thousands of young people pass through its ranks, although it collapsed after a few relatively successful years owing to financial problems. Markievicz and Hobson fell into conversation and the two became determined to establish a nationalist, and national, scouting movement. Within days advertisements began appearing in the radical nationalist press and the launch was heralded through the structures of many nationalist organisations. Na Fianna Éireann was founded in a hall at 34 Lower Camden Street, Dublin. Markievicz had rented the hall at her own expense for ten shillings a week. On the night of 16 August their initial endeavour was rewarded by the attendance of 100 boys interested in hearing what this new ‘national boys’ organisation’ would be like. It is significant that many of those who attended this inaugural meeting were sufficiently inspired that they would remain as members from this point right through the Irish revolution—with Padraic Ó Riain, Eamon Martin, Paddy Ward and Séamus MacCaisin exemplary in this context. 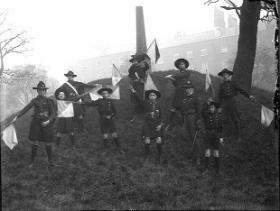 Na Fianna Éireann scouts engaged in field medical training and signal training with flags. The Fianna found its first years difficult and by 1912 had barely 1,000 members and a skeleton structure outside of the cities of Dublin, Cork, Belfast and Galway. But in the next couple of years the momentum of events carried the Fianna forward. It was involved in initiating the militarisation of the IRB, the launch of the Irish Volunteers and showing solidarity with the striking Irish Transport and General Workers’ Union; and it was crucial to the success of the Howth and Kilcoole gunrunning operations. Alongside these headline-grabbing activities, the Fianna continued with classes, drilling, camps, protests etc. and reaped the benefits of an expanding membership and structure. When the fighting started the Fianna weren’t found wanting either. In 1916 Na Fianna members were present in all areas that mobilised and fought alongside all the other Republican organisations. They continued to fight throughout the War of Independence and Civil War; seeing comrades being killed in action or executed or suffering imprisonment didn’t dim their enthusiasm for the fight. In Na Fianna Éireann’s March 1922 Árd Fheis the 187 delegates representing 30,000 members voted unanimously to reject the Treaty. While the events in which the Fianna members were involved over the revolutionary years have a special place in Irish history, the specific role of the Fianna is absent from most written histories. This, allied with the failure to adequately commemorate the organisation’s centenary, marks a kind of revisionism of omission—a Bermuda Triangle of commemoration, if you like. 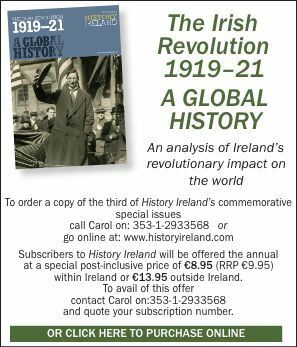 Damian Lawlor is author of Na Fianna Éireann and the Irish Revolution: 1909–1923 (Caoillte Books, 2009).